One way or another your jeans came from the Indus Valley in Pakistan and northeast India. The Indus is a huge valley and river system that drains part of the Himalayan Mountains and is the birthplace of cotton. River and groundwater are used to irrigate rows of cotton plants. The jeans you’re wearing contain about 800 grams (28 ounces) of cotton, and it took a whopping 15,000 liters (3,960 gallons) of water to grow that much cotton in this dry part of the world. Most of the water evaporated or was used by the cotton plants, and some ended up as wastewater or gray water. That raw cotton was shipped to an urban center or to another country such as Bangladesh, the biggest exporter of textiles. In the factory the raw cotton is washed, dyed and then washed again. If you think about it, putting on our clothing is like wearing some of the water, soil and sun of faraway places such as the Indus Valley in Pakistan, and the labor of the hard-working hands in the cotton mills of Dhaka, Bangladesh. Shop at Thrift Stores -save 2,900 liters (766 gallons) by just buying a previously-loved T-shirt! Shop Organic – cotton grown without the use of insecticides and chemical fertilizers, and thus it has a smaller water footprint because it produces little water pollution. We don’t realize our societies run on water not oil. There is no electricity or gasoline without water. Nothing can be manufactured without water. The critically-acclaimed book Your Water Footprint (YWF), uses info graphics to reveal the enormous quantities of water that are used to make the clothes we wear, the electronic devices we use and the food we eat. On average our daily water footprint amounts to 8,000 litres (2100 gal). This is the net amount, water that can’t be reused. Understand labels – “Best Before,” “Use By” and “Best By” dates have nothing to do with health or food safety. Manufacturers simply decide how long their products will remain at peak quality. Go easy on impulse and bulk food purchases. It’s easier to curb waste by buying more often instead of purchasing massive cartloads that are hard to keep track of. When eating out, share meals—the average portion has already been supersized. Food waste is making climate change worse as well. Outdoor water use for gardens, washing cars and watering lawns can account for at least half, and often far more, of our daily direct consumption of water. We could easily reduce our indoor and outdoor water use by 70%. For lawns let the grass grow taller to about 8–10 centimeters (3–4 inches) and add organic matter to improve water retention. On average our water footprint amounts to 8,000 litres (2100 gal) of water each day. This is the net amount, water that can’t be reused. Water-wise choices is all about smart substitutions and changes in habits. Between 30 and 40% of all food is wasted. That means the enormous amounts of water needed to grow and process this food is also wasted. Check for toilet leaks by adding food coloring to the tank. If the toilet is leaking, color will appear in the bowl within 30 minutes. (Flush as soon as test is done, since the food coloring may stain.) Check for worn-out, corroded or bent parts. Most replacement parts are inexpensive, readily available and easily installed. For kids and classrooms too! More than 100 million people in India do not have access to safe water. Severe water scarcity in India is exacerbated by the cotton industry. Concerns are high, but are businesses, consumers and government doing enough? You might not realise it, but India exports enormous amounts of water when it exports raw materials such as cotton and products such as automobiles. The water consumed to grow India’s cotton exports in 2013 would be enough to supply 85% of the country’s 1.24 billion people with 100 litres of water every day for a year. Meanwhile, more than 100 million people in India do not have access to safe water. Cotton is by no means India’s largest export commodity – petroleum products followed by gems and jewellery follow closely behind. All of these exports require water to produce, and the quantities needed are staggering. Not only does it take water to grow anything, it also takes water to make anything: cars, furniture, books, electronics, buildings, jewellery, toys and even electricity. This water that goes largely unseen is called virtual water. What’s easy to forget is that virtual water is as real as the water you drink. Producing 1kg of cotton in India consumes 22,500 litres of water, on average, according to research done by the Water Footprint Network. In other words, this 22,500 litres of water cannot be used for anything else because it has either evaporated or is too contaminated for reuse. By exporting more than 7.5m bales of cotton in 2013, India also exported about 38bn cubic metres of virtual water. Those 38bn cubic metres consumed in production of all that cotton weren’t used for anything else. Yet, this amount of water would more than meet the daily needs of 85% of India’s vast population for a year. Cotton doesn’t usually consume this much water. The global average water footprint for 1kg of cotton is 10,000 litres. Even with irrigation, US cotton uses just 8,000 litres per kg. The far higher water footprint for India’s cotton is due to inefficient water use and high rates of water pollution — about 50% of all pesticides used (pdf) in the country are in cotton production. Most of India’s cotton is grown in drier regions and the government subsidises the costs of farmers’ electric pumps, placing no limits on the volumes of groundwater extracted at little or no cost. This has created a widespread pattern of unsustainable water use and strained electrical grids. Recent reports show that India’s water consumption is far too high. In 54% of the country 40 to 80% of annually available surface water is used. To be sustainable, consumption should be no more than 20% in humid zones and 5% in dry areas, to maintain the ecological function of rivers and wetlands, experts say (pdf). India’s extensive groundwater resources are also rapidly being depleted, with 58% of wells in the drier north-west India experiencing declining water levels. By 2030 demand will outstrip supply by 50%, according to the World Resources Institute. “India’s water problems are well-known in the country and pollution is everywhere. Disagreement lies in the solutions,” says Arjen Hoekstra, professor in water management at the University of Twente in the Netherlands. The new Indian government’s solution to the spectre of growing severe water scarcity is the $168bn (£113bn) National River Linking Project, which will link 30 rivers with 15,000km of canals. This will transfer 137bn cubic metres of water annually from wetter regions to drier ones. However, the country exports far more water than that, in the form of virtual water, in cotton, sugar, cereals, motor vehicles and its many other exports. All of these exports could be produced using far less water, says Hoekstra, who pioneered the water footprint concept. “It’s not just improving water efficiency that could dramatically reduce India’s water consumption, it’s growing and producing things in the right place,” he said. Most of India’s water-rich crops such as cereals and cotton are grown in the dry states of Punjab, Uttar Pradesh and Haryana, which have very high evaporation rates, unlike wet states such as Bihar, Jharkhand and Orissa. This perverse situation greatly exacerbates India’s water problems and is largely the result of government policies, Hoekstra’s 2009 study (pdf) states. “There’s a lot of concern about water scarcity, but little interest in changing consumption patterns,” Hoekstra said. That said, there is growing interest in the Better Cotton Initiative, an industry-led effort using standards to reduce cotton’s water footprint. Organic cotton production also has a lower net water use because it uses no chemicals. Encouragingly, India currently produces two-thirds of the world’s organic cotton. However, this is just 2% of the country’s cotton acreage. Rather than matching production of goods to the sustainable use of existing water resources, India, like governments around the world, hopes to use engineering to increase the amount of water, said Hoekstra. Instead, India could grow cotton in less arid regions with more efficient irrigation and fewer pesticides to greatly reduce the crop’s impact on water resources. 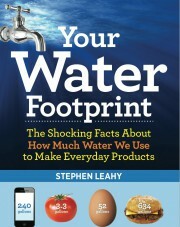 Stephen Leahy is an international award winning journalist and author of Your Water Footprint, winner of the best science book for 2014. First published at The Guardian Friday 20 March 2015 14.12 GMT. Stephen, author of “Your Water Footprint: The Shocking Facts About How Much Water We Use To Make Everyday Products”, will show how our entire society runs on water NOT oil. Copies of Your Water Footprint will be offered for sale by Different Drummer Books and Stephen will be happy to sign them. For information & reservations, contact Barry Wylie, President, at barrywylie1@gmail.com or (905) 827-6302. Please notify us of a cancellation by Tuesday, February 16. I used 140 litres of water to make my cup of coffee this morning. You did, too. It takes 140 litres of water to grow and process the coffee beans to make one regular cup of joe. That’s a lot considering the average bathtub holds 60 to 80 litres. Add today’s breakfast binge to my two cups of coffee (280 litres) and we get nearly 1,000 litres: small orange juice (200 litres); two slices of toast (112 litres); two eggs (400 litres). It’s not even 8 am and I’ve consumed enough water to swim in. Even after 20 years of covering environmental issues, I’m still amazed it took 7,600 litres to make my jeans and another 3,000 litres for my T-shirt. That’s how much water was needed to grow and process the cotton. We’re surrounded by the hidden costs of water. Thousands of litres are consumed in making everything we eat and buy. I choose the term “consume” because this water can no longer be used for anything else. Cars, furniture, books, dishes, TVs, highways, buildings, jewellery, toys and even electricity and gasoline would not exist without water. We can’t see this “virtual” water, but it’s as real as the liquid we drink. Oil steals all the media headlines, but water is far more valuable and important. In January, the dark-suited VVIPs at the World Economic Forum emerged from their secluded retreat in Davos, Switzerland, to declare water scarcity the biggest risk facing humanity in the next 10 years. Two in five people already suffer regularly due to a lack of water, and that number’s rising to three in five by 2025. Peak water is here. This has huge implications for food production, among other things. Climate change is one of the driving factors, but the biggest is our growing water consumption to make all our stuff. The water footprint of a 500 ml bottled of water is 5.5 litres: 0.5 for the drinking water and another 5 contaminated in the process of making the plastic bottle from oil. The 5 litres are as real as the 500 ml, but hardly anyone in business or government accounts for it. The waste of water is another reason to stop using bottled water, plastic bags and other single-use plastics. Arjen Hoekstra at the University of Twente in the Netherlands originated the concept of water footprints. The amount consumed to make something can vary enormously depending on where the raw materials come from and how they’re processed. Rice grown in the dry desert air of California, for example, needs a lot more water than rice grown in humid Thailand. One of the biggest surprises is how much less water goes directly to drinking, cooking and showering than to agriculture and manufacturing. Now, 300 litres is not a trivial amount. Imagine hauling 300 kilos of water in buckets every day. However, the virtual water that’s in the things we eat, wear and employ in North America each day averages 7,600 litres, resulting in a daily water footprint of almost 8,000 litres per person. That’s more than twice the global average. Think of running shoes side by side: the global shoe is a size 8; the North American a size 18; in China or India a size 6. Water scarcity is an increasing reality in Canada. This year, Vancouver and other parts of the “wet coast” in British Columbia are under water restrictions. In Alberta, farmers are unable to grow crops to feed their cattle. In the U.S., California’s four-year drought appears to be part of a larger climate-change-driven mega-drought affecting the entire Southwest. Around 90 per cent of California’s water footprint is consumed by agriculture and industry. Sure, lawns are dumb in a state that is mostly desert, but so is growing 5 billion pounds of rice or being the U.S.’s largest dairy producer. The good news is that we can do nearly everything using less water. While low-flow shower heads and toilets are great, the water footprint concept can lead to even bigger reductions. It’s all about smart substitutions and changes rather than sacrifice and self-denial, but we can’t make the right choices unless we begin to see and understand our invisible reliance on water. • Downsize your plate size to cut food waste. Forty per cent of all food in North America is wasted, including the incredible amounts of water used to produce it. • Ignore best-before dates. They have nothing to do with food safety. • Serve chicken instead of beef to reduce water use. Add in Meatless Mondays and your yearly water savings would nearly fill an Olympic-sized pool.